Collaboration members should sign out to view this page correctly. Click here for a full screen stream of event displays. Click here to read a European Journal of Physics paper published by young students performing image processing to extract the data from these event displays to replicate an early LHC measurement. One can also take the physical parameters of collision data and transform them to sound, a process called sonification. The Quantizer project, developed in collaboration with MIT Media Lab, applies pre-defined mappings, developed by musical composers, to create unique real-time streams of, well, the songs of nature. Give a listen. The LHC Page 1 site on the Vistar server at CERN provides a summary of the current LHC conditions. 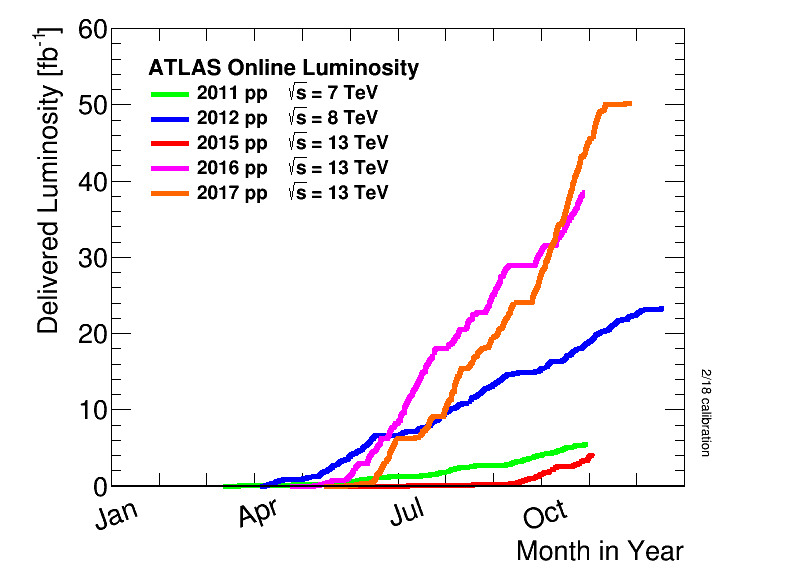 This luminosity plot indicates how many proton collisions have been delivered each year by the LHC to ATLAS.